1 What is Periodontal Abscess? Periodontal Abscess is developed due to accumulation of pus in the gum (gingival sulcus) or other associated periodontal sites. Localized bacterial infection causes destruct of the affected tissue. 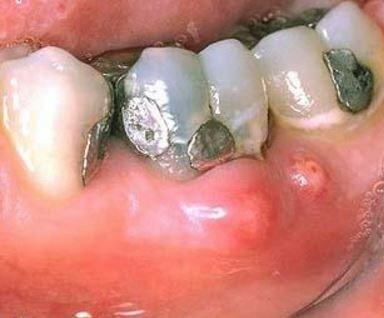 This acute infection spread to the oral cavity. The causative bacteria which involve in developing infection are P. intermedia, P. gingivalis, P. Micros, B. forsythus and F. Nucleatum. Other than these, Candida species also involve in developing periodontal Abscess. These microorganisms are mainly gram negative and may continue living with existing periodontitis, but periodontal abscess can also develop without periodontitis. The origin of the abscess is started at periodontal pocket. Usually periodontitis is formed and turned to chronic condition affects and destroys the adjoining tissues, including periodontal ligaments and alveolar bone. In chronic untreated condition can lead to loss of tooth and facial cellulites. The deteriorating effect of periodontal abscess depends on the size of the abscess. 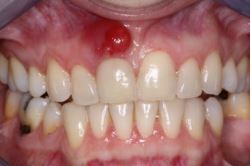 The predominance of periodontal abscess is very frequent and early diagnosis helps to prevent spread of the infection. 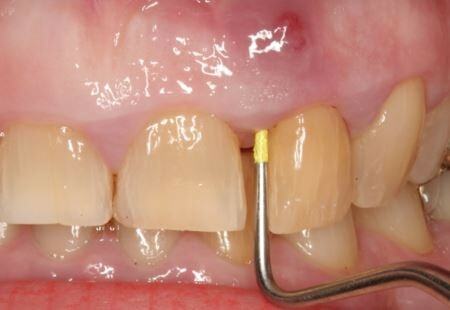 Defective periodontal pockets gradually convert to an abscess. 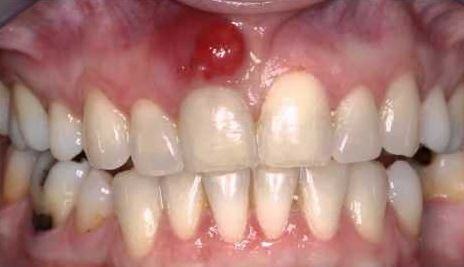 Infections in periodontal pockets extended into margin and also affect the surrounded tissue. This increases the load of the suppuration inside the closed pocket. Gradually pus formed and accumulates at the gingival margin, which then invades into the tooth surface. Pocket lumen becomes incompetent to outlet the accumulated suppuration due to inefficiency of host defence or increased susceptibility to bacterial infection. Eruption into the gum due to impaction of toothbrush bristle or fish bone. Dental scaling is the process to remove dental calculus. Improper scaling technique causes retention of calculus in pocket lumen or calculus remains at the gingival tissue. This often leads to swelling which blocks the normal drainage and abscess is formed. 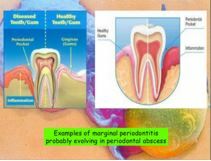 The chances of development of the secondary infection increased in advance stage of periodontitis. Subgingival detriments not treated with antibiotics can lead to abscess formation. During the root canal process, perforation of the lateral too wall of the tooth is common, due to endodontic instrument. Sometimes this also causes super-infection and abscess become formed. Other than these, the factors which triggering the periodontal abscess formation are: cracked tooth, root resorption, cemental tears and invaginated tooth. In rare cases, facial cellulites may occur. Drainage of the pus is foremost objective of the treatment and for that usually drilling or pricking at the pulp conducted to make a channel. Sometime incision of the abscess is also followed to drain the pus. Even tooth extraction is required to conduct the drainage. These techniques conducted through using anaesthesia. To control the spreading of infection in the oral cavity dentists often advised to use chlorhexidine mouthwash. After controlling the infection dentist usually suggested to conduct scaling to remove the plaque and calculus, which are deposited on the root surfaces. Root canal is also required to safe the affected tooth.